Salisbury, North Carolina, is the county seat of Rowan County, which was carved in 1753 from Anson County. Salisbury, located on the junction of a Native American trading route and the Great Wagon Road through North Carolina, was an important economic crossroads through most of the 18th and 19th centuries. 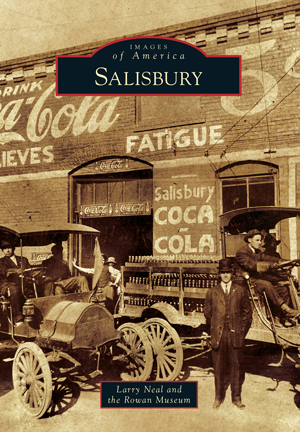 Salisbury became a railroad hub in the 1850s, was the location of a large Confederate prison during the Civil War, and is home to two historic colleges—Catawba College and Livingstone College. The locally popular soft drink Cheerwine has been headquartered in Salisbury since 1917. Today, Salisbury is revered as a historic North Carolina city that preserves the past while actively embracing the future. Salisbury showcases the rich transportation, commercial, and community history of this piedmont city. Larry Neal currently works as manager of Reed Gold Mine State Historic Site near Midland, North Carolina. Author of the book Southern Railway's Historic Spencer Shops, he has lived in Rowan County since 1997. The Rowan Museum, located in the historic 1854 courthouse, was founded in 1953. The museum maintains and operates two local historic house museums, including the 1766 Old Stone House and the 1815 Utzman-Chambers House.